The new release from the Fedora Project, release 15 with codename "Lovelock" was made available for download yesterday. Fedora releases are always awaited with significant anticipation, and this one has been no exception. The new release from the Fedora Project, release 15 with codename "Lovelock" was made available for download yesterday. 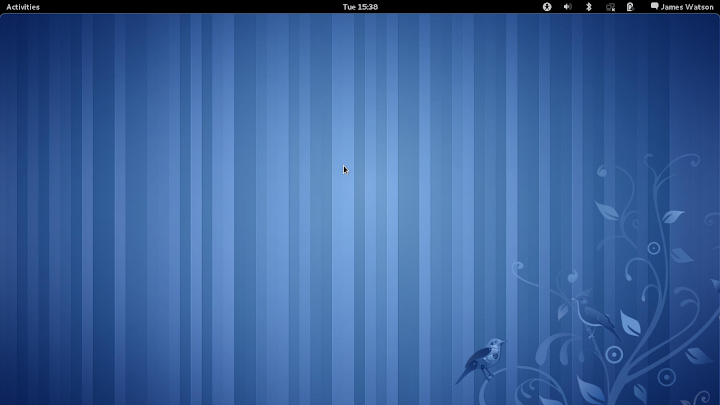 Fedora releases are always awaited with significant anticipation, and this one has been no exception. 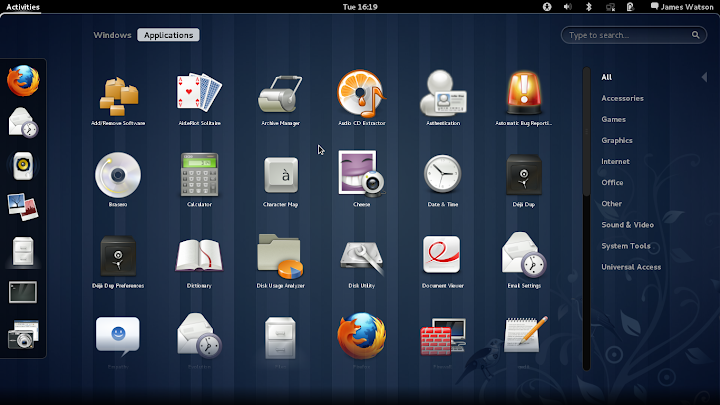 The biggest news about this release, in my opinion, is that they have changed to a Gnome 3 desktop. 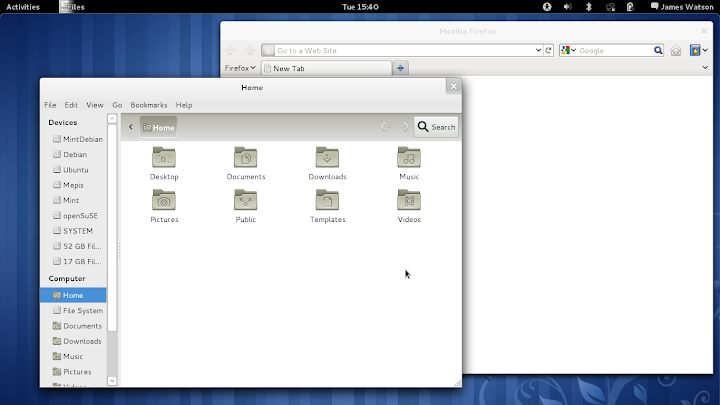 As far as I am aware, they are the first "major" distribution to use Gnome 3 as their default desktop. Because of that, and the obvious comparisons to Ubuntu's recent release of their Unity desktop, this will be the primary focus of this writeup. The initial display shows all of the applications, but of course there is a categorized list down the right side of the screen which can be useful (if you know what category the application you are looking for is in...). At the top right of the screen is a Search box, where you can type in any part of the name or description to get a list of matching applications. It is also quite easy to add applications to the favorites list, just right-click on the icon and select "Add to Favorites", as I have done for the Terminal and Screenshot applications. Launch an application by clicking its icon, either in the main list or on the favorites list, as I have done here for Firefox. Here you get your first look at one of the most controversial changes in Gnome 3. Look at the top right corner of the window... no Maximize/Minimize buttons! The Gnome developers have decided that those buttons are unnecessary or even unwanted, for a variety of reasons. In a nutshell, the theory is that maximize/unmaximize can be done very easily by double-clicking on the window title bar, and minimize is potentially confusing because with the new desktop design there is nowhere to "minimize to". Yes, you read that right - there is no taskbar, window list, dock or whatever to show minimized windows, so they just sort of "disappear", which I agree can be disconcerting at first. Minimized windows are shown in the "Windows" list mentioned above, and can be selected from there. It will be interesting to see how all of this works out, but I can say for sure that after the controversy over Ubuntu moving the window controls to the left side, this change is likely to create even more of a fuss. What else is there to say about this new launcher? Well, for one thing getting multiple windows of the same type open turns out to be a bit of an adventure the first time. It turns out that the obvious choice, simply clicking the application icon again, just takes you back to the application you have open already. Most applications have some sort of a "New Window" item in their "File" menu which will get the job done, but that's not always very convenient. What you actually want to do is right-click on the application icon, and choose "New Window" - not so bad, once you know it. Another interesting tidbit in the Windows display, you can actually close a window from that point without actually activating it again. When the mouse cursor is on a window an "X" button is added to the top right corner, clicking that will close the application. The windows will be arranged, stacked and managed in more or less the same way as with previous Gnome release, with a couple of interesting additions and improvements. Right-click on the window title bar, and you will get a list of window management options. This makes things like "always on top" nicely accessible, and it adds some new options for managing workspaces, such as "Always in Visible Workspace", or "Move to Workspace". 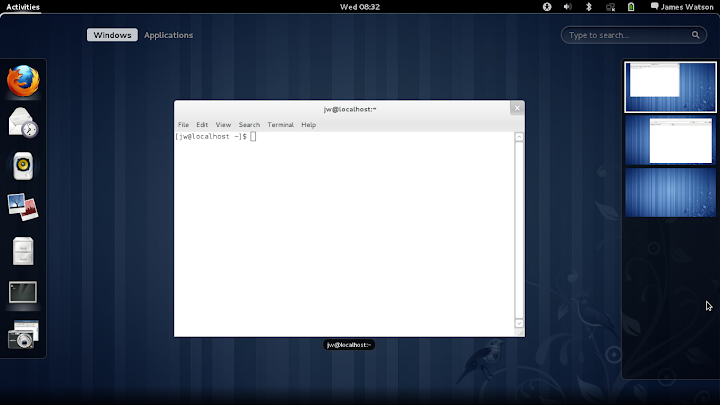 I find this to be significantly better than workspace management was in Gnome 2. I have spent too much time squinting at the tiny icons in the Panel, trying to guess which one contained the window I was looking for (I know, it's my own fault...). Here you have a nice big display of each workspace, you can see pretty well what is happening on each of them, and the display is even dynamic - if there is something changing on the display in the workspaces, you will be able to see the changes in the Windows selection area and in the Workspace selection area. Clicking on one of the workspaces will display the windows from that workspace in the Windows selection area. This is good stuff. 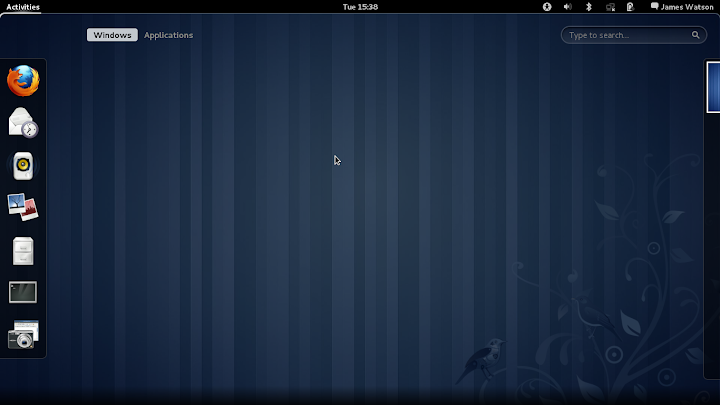 Ok, that's enough to digest in a first quick run through Fedora 15 and Gnome 3. What about the results of actual installations? Well, I think the best summary I can give is "mixed". On my main laptop system, which is a "bog-standard" Intel system that is 2.5 years old, Fedora 15 installed very easily (and very quickly), and absolutely everything works. I assume that this will be the case with most desktop and laptop systems which are not pushing the leading edge of hardware components. However, on my very new sub-notebook and netbook systems which have very new WiFi adapters and touchpads, things didn't go as smoothly. The driver for the Broadcom 4313 wireless adapter (brcm80211) is not included in this release at all - even though the firmware for it is included. I asked Adam Williamson about it, and he explained that this is because the driver is still in "staging", and staging drivers are generally not included in the Fedora distribution unless someone at the Fedora Project is directly involved in the development. Well, fair enough I suppose, but I think there are going to be a lot of disappointed and confused people as a consequence of this, so I hope the brcm80211 driver is added in a Fedora update before too long. On my newest sub-notebook, the HP Pavilion dm1-3105ez, the situation is even worse. The driver for the Ralink 5390 wireless adapter is also not included, and although I have been able to compile and install the driver for it on every other distribution I have tried so far (openSuSE, Ubuntu, Mint, Debian, Mint Debian and Mepis), I wasn't able to do so on Fedora 15. This might be my own failure, I'm still looking into it, but at least it does not work when I do exactly the same as I did for the other distributions. To top it all off, there is the joy of the Synaptic ClickPad. Sigh. I really wish someone at Synaptics had decided to use these things as earrings or something, because they are a royal pain the in rear, even when they work! 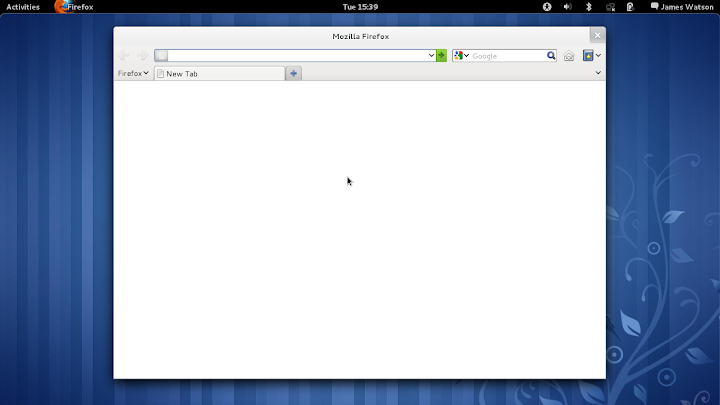 Fedora 15 at least recognizes them and the basic functions of moving, clicking and tapping (if you enable it) work. But it doesn't recognize them as "ClickPad" devices, which is a bit surprising because Fedora 15 includes the synaptic driver version 1.4.0. The result of this is that the right button doesn't work, which is not a good thing, but even worse it is basically impossible to click and drag something. It is mildly amusing at first to watch what happens as things zoom wildly around the screen, but that entertainment value lasts about 5 seconds, then frustration and the need to get some work done take over, and you dig out a USB mouse to use instead. This is really unfortunate, when you compare it to the way that openSuSE 11.4 has finally gotten the ClickPad just right, and it is actually quite usable. Whew. That was longer than I had intended it to be, but I suppose with a release which makes changes of this magnitude it is to be expected. My personal summary is that Gnome 3 seems pretty nice, and I have made a lot more progress in adjusting and adapting to it, and actually starting to like it in a relatively short time than I ever have made with Ubuntu Unity. I think for Fedora loyalists this will be an excellent new release, if they are willing and able to accept Gnome 3; the same is probably true of those who are new to Fedora but at least have supported hardware. But for those with "difficult" hardware, such as my WiFi adapters and ClickPads, it would take a lot of determination to stick with Fedora 15 when there are a number of alternatives with much better support for those devices already available.